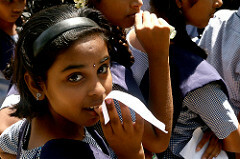 NGO News blog, NewsLine: Girl children Education is vital for societal development. Girl children Education is vital for societal development. Girls student of SEVAI Shanthi Matriculation Higher Secondary School.